This Series started as a Secret Santa Fic and has exploded with a life of it's own. It begins with the revelation Loki didn't stop with creating a clone of Jack O'Neill. He created four children with cloning technology and various combinations of DNA from SG1 and Janet Frasier. Loki had also been experimenting with his own little breeding program 20 odd years before--that resulted in one Alexander LaVelle Harris. The insanity only builds from there. The stories are listed in order but each can stand alone. Below is a list of "The family". Regulars in the stories include Wesley Wyndham Pryce, Connor Angel, General George Hammond and Paul Davis visits from various other of the show casts. Notably Thor, Bra'tac,and Jacob Carter/Selmac, amongst others. all stories rated 15 overall warnings for a bit of language and adult humor, slayer-style violence and general insanity. Chase Kowalsky - Born Charles Tyler O'Neill, on an alternate earth. All I Want For Christmas--Loki's at it again, what's more is he's done it before. Xander's real father challenge, with a few extra twists. 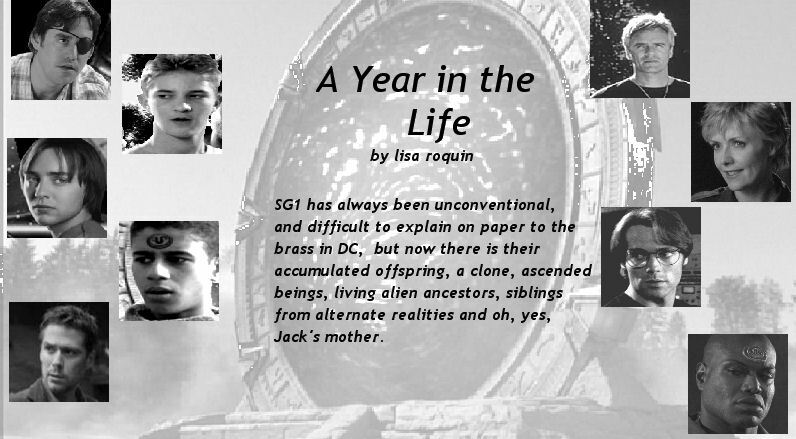 Happy New Year--Clan SG1 and friends celebrate the New Year. Valentine's Day--Valentine's Day at the SG1 ranch. Pete gets a few surprises. So Much for R and R--SG1 is MIA and Paul Davis' much looked forward to leave just went out the window. Luck of the Irish--Saint Patrick's Day...and just what sort of Snakes did St. Patrick drive out of Ireland? Cassie's Revenge--PG--Cassie's had enough of the big brother routine. TtH 20 minute April Fools Challenge ficlet. Exercizes in Creative Writing I: Colonel Hargrove--Hargrove gets stuck writing up the events of Mother's Day. Get A Clue, Already--Divine Intervention, Cordelia style. YitL cross with the Sentinel. SGC O'Neill Orientation--Paul attempts to explain the O'Neills to the newly arrived international troops. Recruiting Dr. Beckett--Xander and Alex go to recruit a certain Scot for the SGC. Wardrobe Malfunction--200 word drabble written for TtH Wardrobe Malfunction challenge. Pretend to Fish --200 word drabble written for tthdrabbles community Summer Nights Challenge. Why Did I Ask?--Teal'c and Andrew debate Star Wars. Snippets of Insanity--odd bits and pieces that didn't quite make it into the main stories. That Rabbit is *Clucking*--Bra'tac doesn't get Tau'ri Holidays. *headdesk**headdesk**headdesk*--Sam gets another one of *those* emails from Andrew. Training--Faith, Ishta and Neith show Andie, Shara, Nesa and Kar'yn how its done. Sparky--Faith's new "baby" is nearly destroyed. It's Siler to the rescue. Family Trees by nibbled_2--these connect to the stories above to help keep straight the chaotic clan as it grows.